Nick Foles started the day off shaky, as his one interception will show, but he recovered from that and had a clean game thereafter. He didn’t impress with multiple big-time throws or with fancy moves in the pocket but managed the game against a depleted Redskins team. That was enough to lead the Eagles to victory and into the playoffs. Before anyone writes off this Eagles defense, they put on a defensive performance to remind the NFL that they are very much still alive. The secondary has been playing better of late, but their front seven is deadly for any offensive line, regardless of the talent. Fletcher Cox was a monster from the interior while Michael Bennett and Brandon Graham were forces off the edge. The play of Malcolm Jenkins shouldn’t be overlooked this season. He’s been the glue for the secondary, even after their midseason struggles because of injuries. He’s been excellent all year and was great again against Washington. He was targeted just once but earned himself a pass breakup on the plays. It wasn’t a pretty effort from safety Deshazor Everett, who was starting in place of the recently cut DJ Swearinger. His struggles were mostly in coverage, but it was an all-around poor performance, as he missed multiple tackles and allowed all five passes targeted into his coverage to be caught. The defensive front seven was roughed up by the Eagles’ offensive line. Most of their struggles were in run defense, but they were unable to get consistent pressure on the quarterback despite getting three sacks. 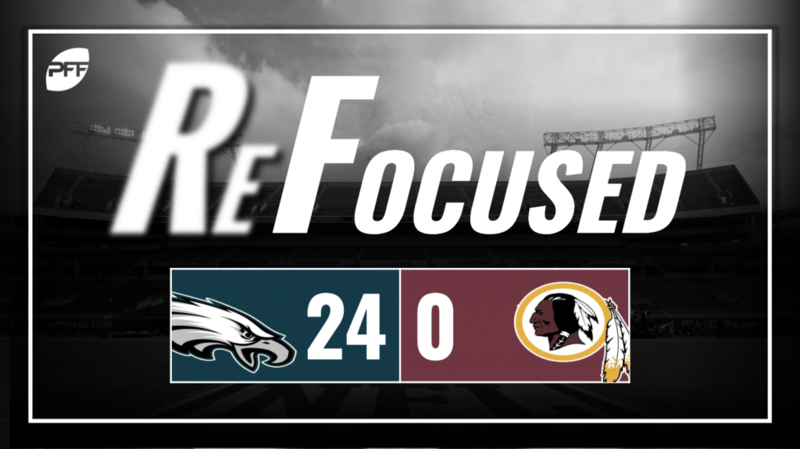 Foles gained first downs on two quarterback sneaks, and the Redskins’ defensive line gave very little resistance. The Josh Johnson experience has officially come to a close. While last week had its moments, this week was devoid of any such good play. Johnson averaged 3.4 yards per attempt (including no plays) while averaging a depth of target of 10.6. That PACR (passing air conversion ratio) is bad, to say the least, and usually indicates a losing effort. The Redskins’ offensive line did Johnson no favors, as he was constantly under pressure throughout the game. Johnson saw a clean pocket less than half the time he saw a disrupted pocket and when that happens, not even Tom Brady in his prime could easily win games. The Eagles’ offensive line dominated all game long and provided Foles time to operate and the run game lanes to run through. The Redskins’ offensive line was abused all game long, which put Johnson under duress early and often, nullifying any chance they might have had in this game.